WASHINGTON, DC -- Defense Secretary Jim Mattis on Friday said that the U.S. will pursue diplomatic channels should tensions flare up over the Trump administration's recent decision to provide lethal weapons to Ukraine. Defense Secretary Jim Mattis (L), greets Ukraine's Minister of Defense Stepan Poltorak, on his arrival to the Pentagon, Friday, Feb. 2, 2018. "The bottom line is, we are engaged diplomatically in attempts to try to get Russia to live by the Minsk agreement and we will continue those efforts through our State Department who are actively engaged in that direct[most] take," Mattis told Military.com during a press briefing. The U.S. in December approved the largest sale of lethal weapons to include American-made Javelin anti-tank missiles -- something Ukraine has long pushed for -- in addition to more small arms such as sniper rifles. Critics of the move have said this could undermine peacekeeping attempts on Ukraine's eastern front, further angering the Russians who would retaliate if provoked by offensive weapons. Poltorak expressed sincere gratitude toward the current U.S. administration -- mentioning specifically the president and Congress -- for sending a clear signal of support "and [m]aking a decision to support Ukraine with lethal equipment." "It is a very timely and a smart decision," Poltorak said. Mattis, although emphasizing continuous U.S. support, did not give a timeline on the arrival of the anti-tank weapons. Poltorak and his accompanying delegation visited the Pentagon to discuss "pragmatic steps" both the U.S. and Ukrainian governments could take in strengthening the military-to-military relationship. The defense minister further expressed he was eager to start talks on future engagement, highlighting that the instructor training program by the U.S.'s National Guard troops "appears to provide significant effectiveness as to the training of our forces." The U.S. -- led by U.S. Army-Europe and rotational U.S. Guard forces, also incorporates British, Canadian and Lithuanian trainers as part of the ongoing Joint Multinational Training Group-Ukraine -- has spearheaded training in Ukraine's western front in Yavoriv since 2015. In recent years, the U.S. has additionally pledged $750 million in non-lethal military equipment for Ukraine, including $175 million to the country's efforts in fighting pro-Russian separatists in the east. Under then-President Barack Obama, the U.S. Treasury also imposed sanctions on Russia for its invasion and annexation of Crimea in March 2014. 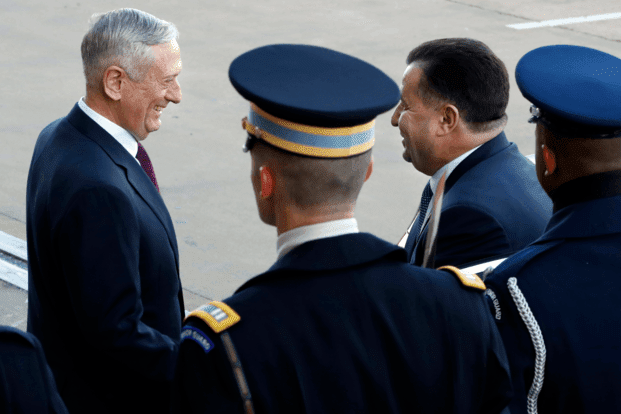 Becoming the first U.S. defense secretary to visit Ukraine since Robert Gates in 2007, Mattis in August visited Kiev, affirming that the pressure for Russia to adhere to the Minsk agreements was still on. The Minsk II agreements stipulate a withdrawal of heavy weapons from the front lines, with such movements approved by the Organization for Security and Co-operation in Europe (OSCE). The secretary on Friday told Poltorak "that the U.S. will continue to engage Russia to end its violence in eastern Ukraine, withdraw its forces and weapons and honor both the letter and the spirit of its international commitments."